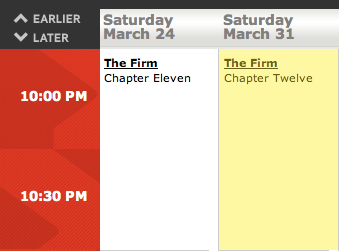 As previously reported, THE FIRM did not air in either Canada or the USA last week. According to the tv schedules for both countries, Chapter 11 is airing this Saturday (March 24). And the schedule for Global TV (Canada) and the episode list at the NBC/Universal website shows Chapter 12 (Aaron’s episode) as airing the following Saturday March 31. 10pm in Canada and 9pm in the USA. Is there anyone in the USA and Canada that can tape the end of Chapter 11 to catch the trailer for Chapter 12? I’m curious to see if Aaron makes it into the trailer. This is the Global TV (Canada) Schedule showing Chapter 11 airing this week and Chapter 12 airing next week. The NBC Universal episode list is showing Chapter 12 as airing on March 31.